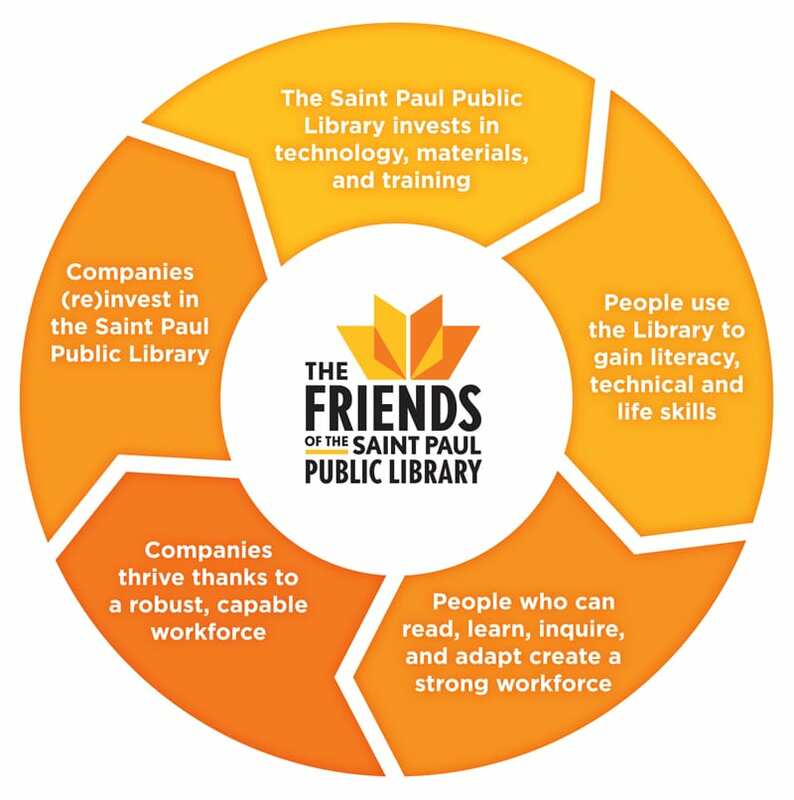 The Friends invests in the Saint Paul Public Library so that it can connect individuals with resources that enrich and improve lives and make Saint Paul communities stronger. One of the ways the Library strengthens communities is by fostering a healthy, sustainable workforce. Read our recent case statement below about why investing in the Library is essential to cultivate the workforce of tomorrow. You can also download an 11×17 pdf of this document here. investing in the Saint Paul Public Library today. To thrive in a changing society, our corporate community depends on a strong workforce pipeline. The foundation of a robust workforce is a community that can read, learn, inquire, and adapt. This is where the Library comes in. The Saint Paul Public Library helps people of all ages and backgrounds read, learn, and be problem solvers. The Library removes barriers to achieving these skills by bridging the achievement gap, supporting adult learners, and providing access to important technical and creative resources. The Library is an engine for equity. With a Saint Paul Public Library branch in every corner of the city and free programs and resources available every day to all, individuals have the opportunity to find the information and develop the skills they need to thrive. Libraries help people prepare to work. The Library cultivates 21st Century Skills in people at every stage of life. Click here to view chart full size. The Saint Paul Public Library has been enormously effective at responding to changes in technology and globalization by offering new learning tools for all ages. Alongside the shelves of books are now computers, maker spaces, community gathering hubs, and classrooms, as well programs that help people acquire new skills. The Library fosters a sustainable cycle of learning that equips today’s workforce – and tomorrow’s – with skills they need to succeed. A new kind of economy. A new kind of worker. Society is being reshaped by technology and globalization. In the old economy, employee loyalty and mastery of specific skills were hallmarks of a productive workplace. Today’s corporate enterprise demands that workers be adaptable, lifelong learners who can thrive in a knowledge-based economy and a technology-driven workplace. The 21st Century Skills Framework highlights the specific competencies necessary in today’s worker. 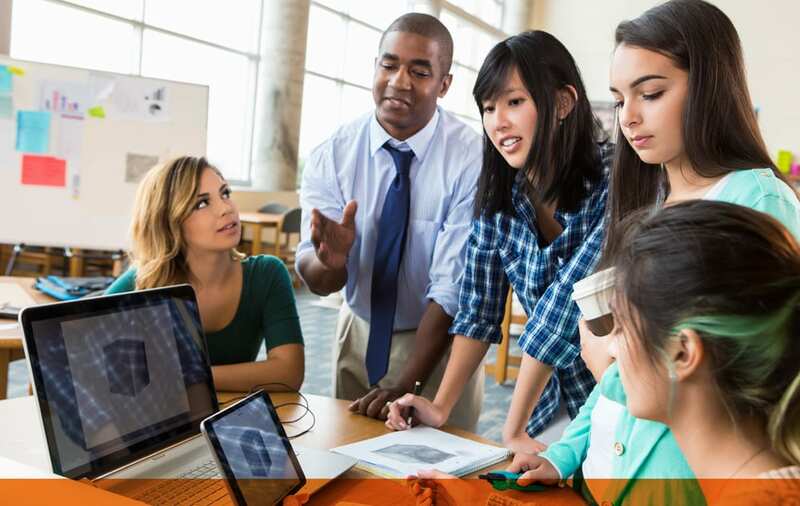 The 21st Century Skills Framework was developed through a partnership between the US Secretary of Labor, US Department of Education, National Education Association, dozens of Fortune 500 corporations, and other entities. Today’s innovators are just as creative and teeming with ideas as Saint Paul’s most well-established brands, but often lack access to the expensive technology and resources necessary to realize their dreams. At Saint Paul Public Library’s Workforce Innovation Center, creators can use technology like 3-D printers, laser engravers, a recording studio, and more to turn their dream into a prototype, and their prototype into a reality. These future leaders can also write their business plan, research financing options, and learn about intellectual property rights and laws. A challenge for the Library. An opportunity for your business. The adaptability demanded by the 21st century workforce holds true for the library itself. A static learning environment will fall short of both our users’ and our community’s expectations. This will ultimately leave employment seekers without the resources necessary to succeed in today’s workforce and employers with fewer qualified candidates. We must continually invest in technology, materials, staff training, and other resources so that Saint Paul Public Libraries remain dynamic homes for the most current information, learning tools, and services. We need you to invest in this essential Saint Paul institution. The Saint Paul Public Library is a department of the City, but funds from corporate and residential taxes do not reach far enough to meet the demands for today’s Library services. The Friends was founded in 1945 by visionary leaders who saw that a strong library was critical to a strong community. As an independent nonprofit, The Friends exists to help libraries, and the communities they serve, thrive. The Friends is committed to providing at least $1 million each year to the Saint Paul Public Library to ensure that essential and inspiring services are available to every interested individual in our City. When you invest in The Friends, you are investing in your future workforce. You are nurturing the Saint Paul Public Library as an information and resource hub. You are supporting the needs and pursuits of a diverse community of lifelong learners who can make our economy and our city stronger. There are lots of ways that your company can make a difference. Contact Greg Giles to discuss creating a partnership with The Friends that works for you.